The prevailing theory about comic journalists goes something like this: those who can write comics, do; those who can’t, write comics journalism. Near as I can tell, for the vast majority of comic journos, that is the case. They see writing about comics as an in to an otherwise impenetrable world, and some have seen success in leveraging that into a job writing or editing comics. It’s a way to do it, but that isn’t my ultimate goal in comics. I don’t want to write them. I want to sell them. My goal at some point is to open my own comic shop. The reason is simple, really. One of my favorite things to do on a Wednesday is to go into my local shop – Bosco’s Comics in Anchorage, Alaska – and talk comics with the employees and customers at the store. Quietly, something I enjoy even more is helping new or long-time readers find something amazing to read, as I talk with them about what they like and guide them to what might satisfy their needs as a reader. I find it to be great fun and very fulfilling. That’s part of why I want to be a retailer. But being a comic book retailer is a lot more than chatting with customers. If it wasn’t, you’d see a lot more comic shops as really, what comic fan wouldn’t want to get paid to talk comics all day? 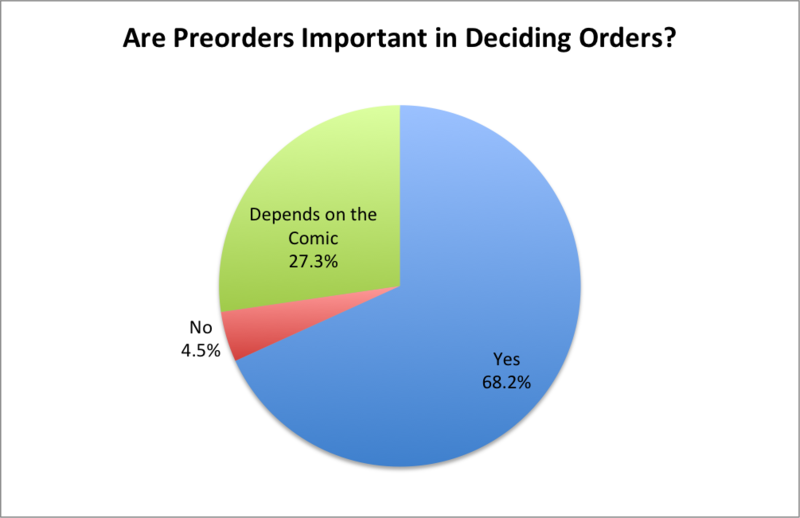 With the way ordering works – initial orders three months out with final order cutoff adjustments at three weeks – complicating matters, customers being unpredictable, and almost zero returnability available for product in comics, owning a comic shop can be an arduous and frustrating experience that can leave the less clever in financial ruin. But it’s both the fun and the frustrating, really. Like with anything, you do all you can to ensure the good outweighs the bad. You do anything you can to make your shop successful and to cut down on the more negative elements of the world. Most readers don’t often think about their comic retailer experience beyond the times their favorite comic is shorted and they want to lead a riot in miniature or they have a good experience chatting with the clerks. But in reality, the men and women who own shops and order the comics we buy are the crux of the entire industry. As much as we like to think that we’re the most important part of the mix for publishers deciding what to or not to produce, we’re not. It’s the retailers. They are the most important customer for every publisher, and their ability to succeed and stay in business keeps putting print comics in our hands. 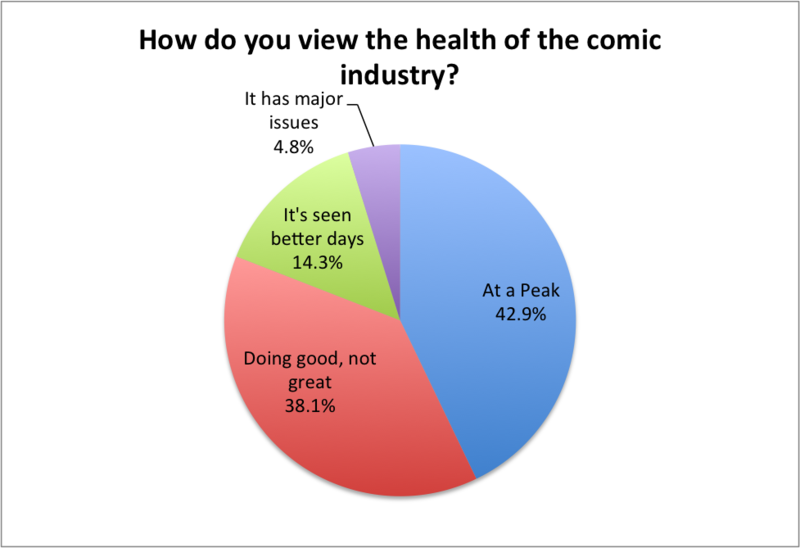 The health of comic book retail is arguably even more important to overall wellness of the industry than any revenue numbers you may see, as those numbers are built on orders from retailers, rather than to customers. While it’s exciting to see huge sales when we peruse Comichron‘s charts, if some of the numbers were generated by one retailer ordering huge on an unreturnable $5.99 title that doesn’t sell, that could put them out of business for good. Seems crazy but it could happen. It flows downwards, and everyone in comics feels it in the slightest of ways. From there, those revenue numbers look a little bit worse. Like I said, retailers are paramount to the success of comics. Today, we’ll be looking into their world with another survey. A couple months back, 25 retailers around the globe – including shops from Canada, the UK, Australia and Ireland – took a 25 question survey about their businesses, what they’ve seen in recent years, how their shops and the industry is performing, the biggest roadblocks, and much more. We’ll dig into what we found and more below. This isn’t meant to define how every comic retailer in the world is doing. Only 25 shops participated, so this is just a small cross section of the industry in total. But it can provide useful information as to how retailers and comics are doing overall. While it may not represent every retailer, it takes the temperature of the industry in a real way. As with previous SKTCHD surveys, not every question was required to be answered. Additionally, the pool was not random, as around 75 total retailers were asked to take part. Lastly, not everyone was a shop owner themselves, but all were official representatives of their shops. Keep that in mind as you read through the results. To open, we will delve into a few charts on who the respondents themselves are in broad strokes. While the information we’re about to go through may not be interesting by itself, it provides context and interesting insight into who the retailers are. Let’s kick things off with two quick demographic questions. 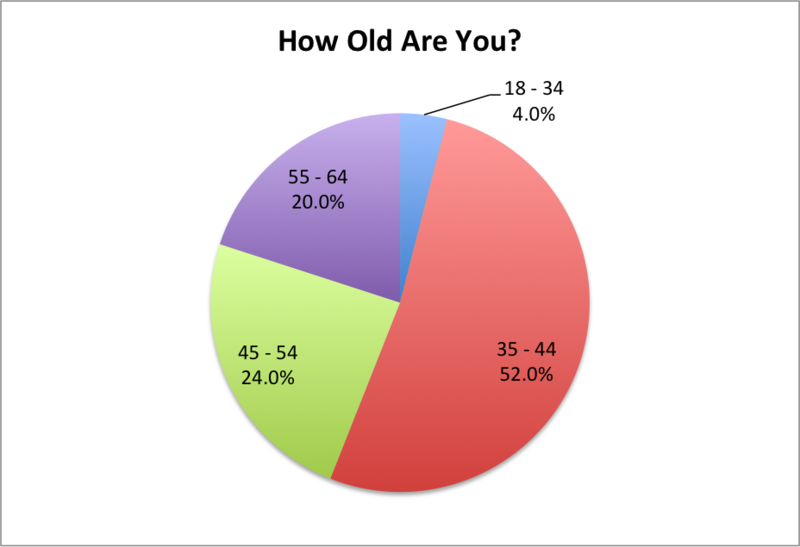 The vast majority of participants in the survey are men who are 35 plus. 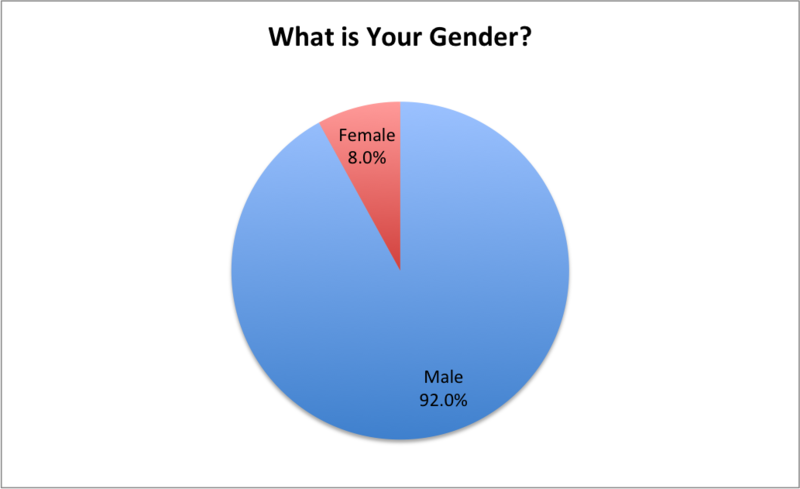 Two of the 25 respondents were women, and one retailer was between 18 and 34. That’s not to say women and young people are absent from the retail equation. Patrick Brower of Challengers Comics + Conversation took part in the survey and the majority of the people who work at his shop are both young and women, and that’s just one shop. But for those who took part in this survey itself, the vast majority fits in those two buckets. Of those who responded, 20 of the 25 own one shop. 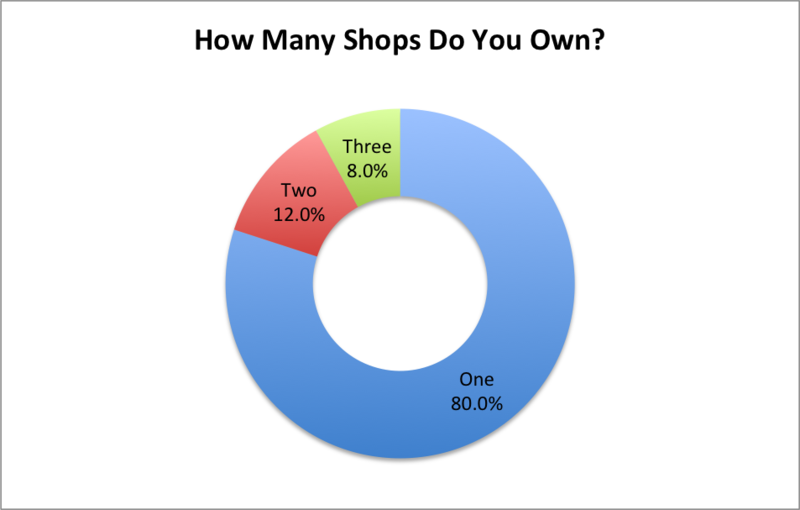 While it makes sense that the majority of retailers own one shop – they’re pricy endeavors – it is encouraging to have multi-shop owners amongst the retailers featured, especially considering there were no chains amongst the contributors. In fact, one respondent – Brian Hibbs of Comix Experience in San Francisco – just acquired his second shop two years ago, so retailers have seen enough success to expand their personal footprints. 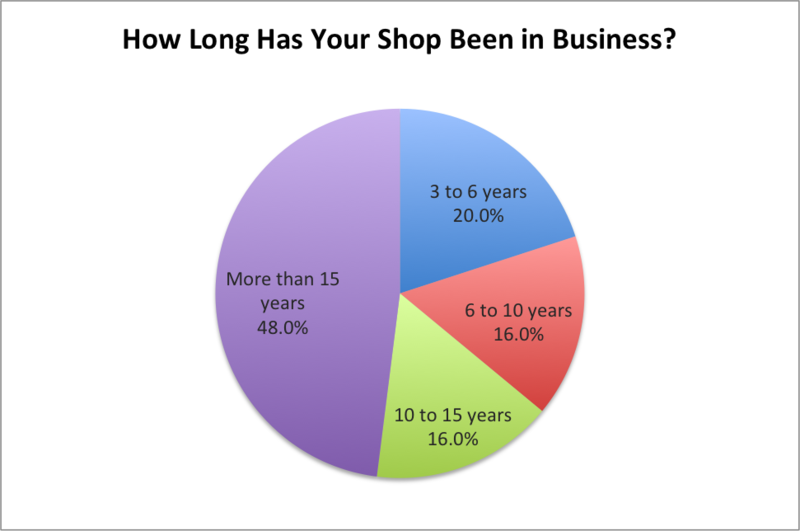 Amongst the respondents, though, zero of them opened their shop within the past three years—Hibbs’ new shop had a previous owner—and 80 percent opened their shops six years ago or longer. There were no new shops amongst those who took part. There are many paths a comic retailer can take in developing and running their business, and many different results can come from them. But in 2015, a time where we’re hitting 20-year highs and comic book movies are dominating at the box office, are retailers seeing the same levels of success other parts of the industry are? The short answer is yes, but with exceptions. 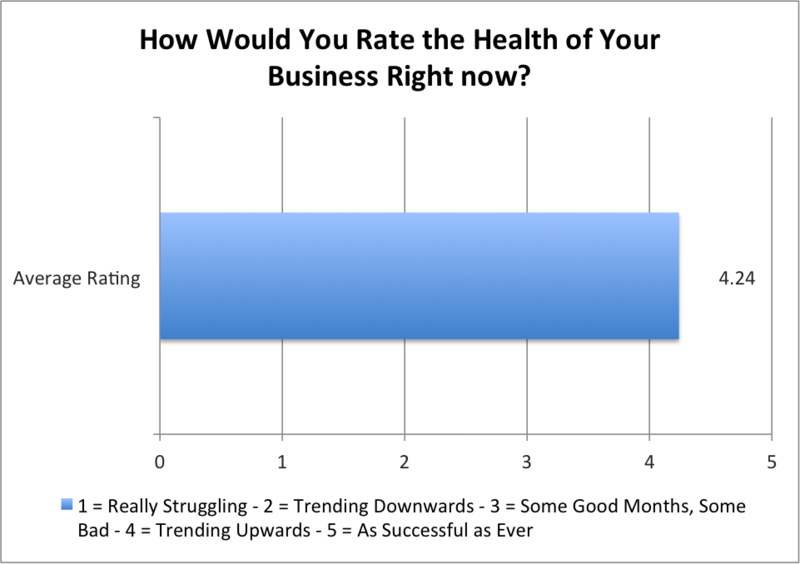 Of those who responded, 90% rated their shop’s health as either trending upwards or as successful as ever. Only one shop rated below a three, and they classified their shop as “really struggling.” Overall though, the numbers are fantastic, and at a base level show the state of retailers is on an equal level with the industry overall. That’s very encouraging, as was the insight they shared. Jeremy Shorr of Titan Comics in Dallas said his shop has been “trending upwards for YEARS now.” Chris Thompson of Orbital Comics in London stated that “there’s definitely been an upswing and consistent growth in recent years. Despite the worldwide recession we seem to have defied the odds and continued to grow through it all.” While it’s not all rosy, as some noted there are still ups and downs and that despite the success cash flow can be a problem, seeing a near universally positive response is a great thing for comics. 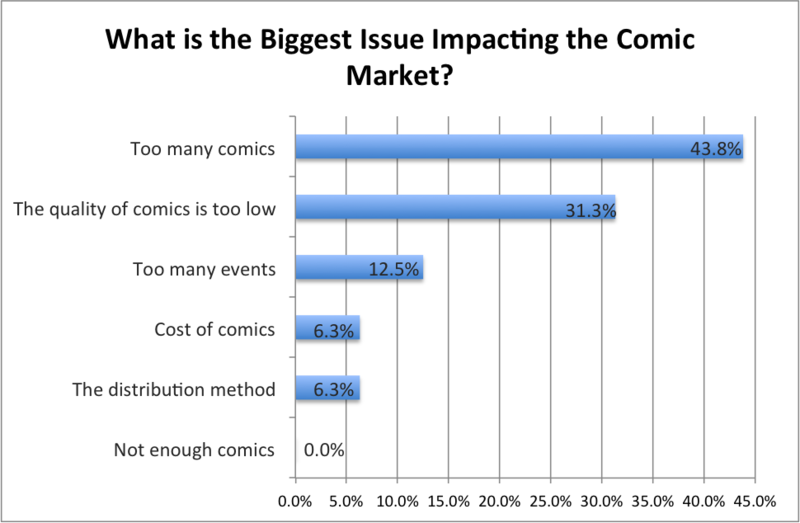 For most retailers who participated, comics and graphic novels are the vast majority of their sales. 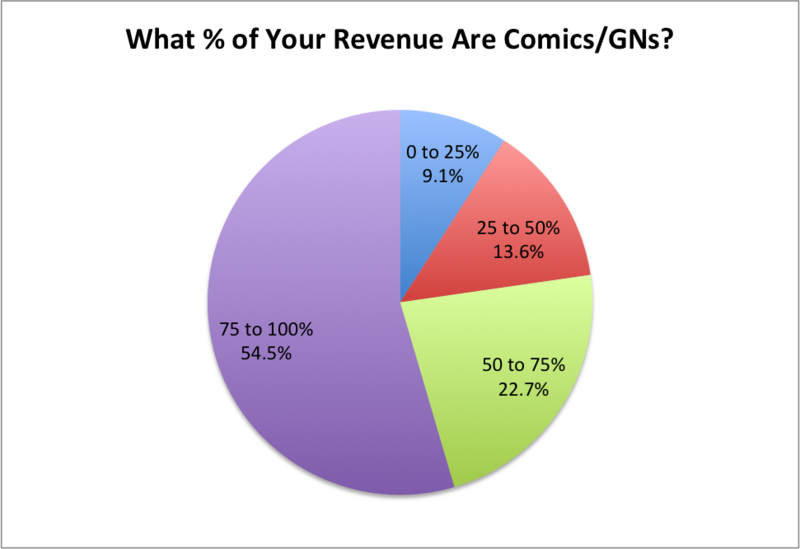 Many comic shops diversify their product lines to expand potential revenue, but over half of the shops who responded see comics and GN’s generate 75% to 100% of their revenue. Almost 80 percent see half or more of their sales from comics. That’s interesting, especially when thinking of shops I’ve experienced and how expansive their non-comic product lists are. This chart is very interesting for several reasons, but the biggest takeaway is how highly rated collections are. Almost every retailer rated them as extremely important, and they finished above the highest selling individual issues in value to retailers. It makes sense given how they’re more attractive to new or casual readers than single issues, and it backs up an excellent piece Matthew Klokel of Fantom Comics (who took part in this survey) wrote about his shop’s experience in 2014. It highlights a continued shift away from the back issue market that used to be a major part of the retail experience (one shop even noted they don’t carry back issues) and towards collections. I found it fascinating that manga – which operate like collections themselves – rated so low for the retailers who participated. One retailer noted “manga sales have been sliding for the last few years,” but he also shared he maintains significant space dedicated to those types of books. For single issues, Marvel, DC and Image – those covered by the 10 percent plus publishers – are very important. The rest are more variable in value, with under 1 percent publishers earning a healthy number of “not important” ratings from retailers. I spoke of new and casual readers earlier, and as you can see in the chart above, they’re coming, and they’re coming worldwide. Over 90 percent shared they have seen an influx of new readers in the past five years, with Brower saying, “I can’t tell you why, but every week we experience someone who is in their very first comic shop.” That’s amazing, and promising for the comic industry even if some shops shared their growth is moderate. But at least they are seeing new readers. Even better? They’re being generated by several disparate sources. Leef Smith of Mission: Comics & Art in San Francisco shared, “Even though I’ve only had the store for just over a five years, I can already tell that there’s been a large influx of cross-over readers, drawn in especially by Saga, The Walking Dead and webcomics.” Neil Farris of Hijinx Comics in San Jose cited comic movies as another boon to his shop, and he wasn’t the only one. Five in total shared that movies and TV shows have driven new readers into their shops. Hibbs cited digital as a big driver, saying, “digital appears to be functioning as the ‘new newsstand’, introducing people to the market so they can come buy ‘real’ versions.” To have a retailer say that is huge, as years before, digital was oft cited as a potential harbinger of doom for print comics. Now? It’s additive, as several retailers shared. The most mentioned reason was simple though: women are reading comics more than ever, or at least at the shops I spoke to. Thompson’s right, and retailers recognizing it is a huge step in getting publishers themselves to do the same. 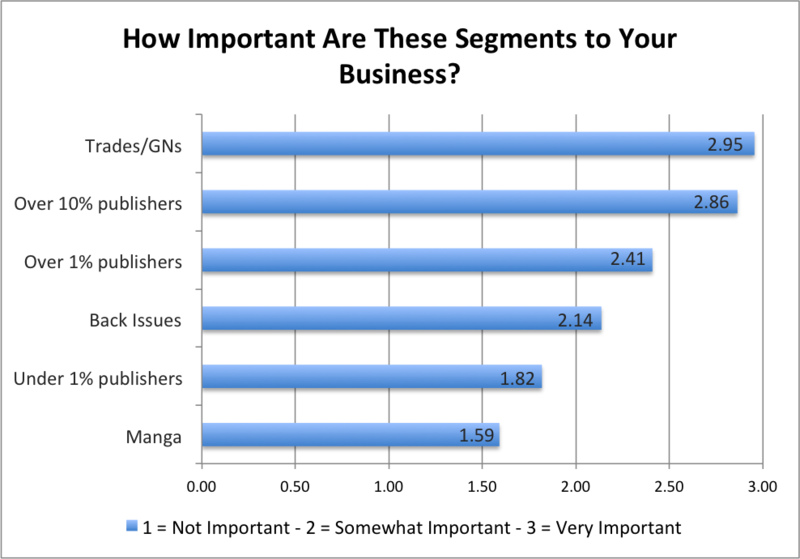 As I said earlier, retailers are publishers’ most important customers. If they share they need more comics for women, then odds are, more will come. And publishers, it’s simple: we do need more comics for women. Just look at the numbers above. 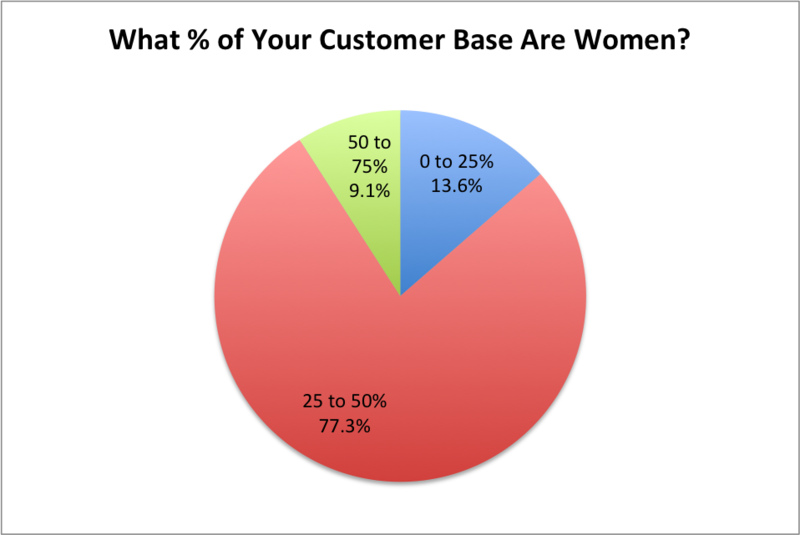 Over three quarters of respondents shared their customer base is now 25 to 50 percent women, and many say that number is growing. Even those who said 0 to 25 percent had caveats, as Michael Bower of Phoenix Comics NW Ltd. in Calgary said “it is much closer to 25% now than it is to 0%. I would guess around 20% currently.” That’s remarkable, and again shows the value of running a shop that is friendly and conscientious of women readers. 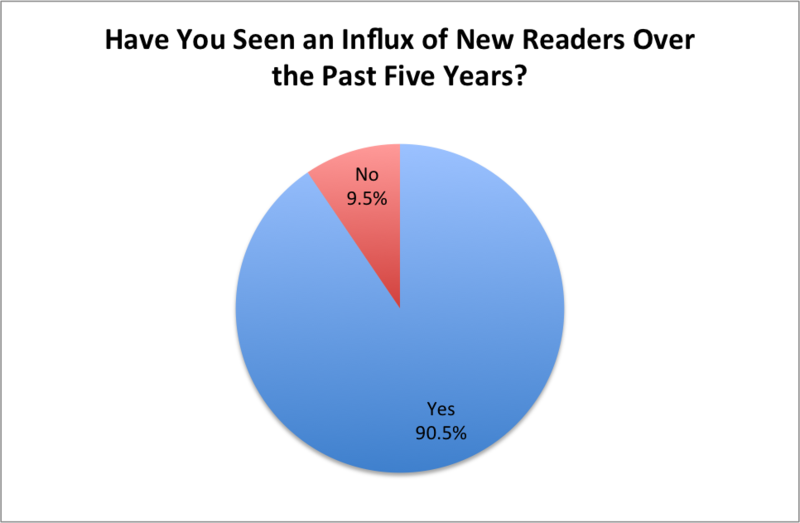 The results about younger readers is a little less impressive, as almost three quarters of respondents shared they make up 0 to 25 percent of their overall audience, but that makes sense, really. Younger people have less buying power, are less likely to be able to make special trips to a comic shop when a book store will do, and are perhaps even more distracted by the deluge of other forms of entertainment in the world today. Of course they comprise less of the overall audience, even if someone like Raina Telgemeier is the biggest name in comics right now. That said, one thing I loved was this: every shop who participated has a dedicated section for younger readers. That’s a good thing. 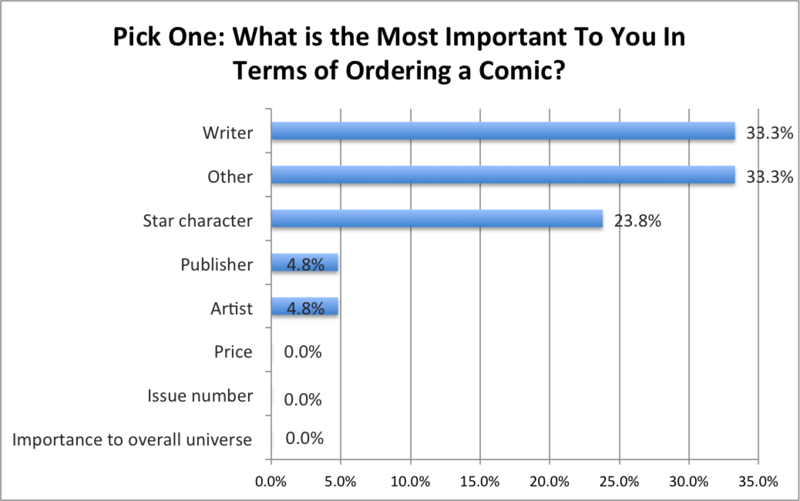 What drives the most orders in comics? Retailers were asked that, and while it’s clear the writer and star characters are important for retailers, “other” shared the lead, and with good reason. Many retailers suggested it’s impossible to decide off one characteristic, and that it is more important to factor in all of the above. So when you see “other”, it means that retailers reject the premise of the question and say that everything matters in ordering, including artists, writers, and everything else. I’m sure all involved would agree with that if given the option. That said, it is interesting that no retailer answered with Price, Importance to Overall Universe or Issue Number. Those may be factors in the grand scheme of things, but retailers will not order big just because something is a number one, a tie-in to an event or competitively priced. Other factors supersede those. Given the results of our artist survey, though, it is fascinating to see writers coming in so much higher than artists. Preorders continue to be vital in the ordering process for most retailers, as only one of the 22 retailers who responded answered in the negative to this question. Most share preorders form the baseline for every title they’re ordering – if the retailer doesn’t find merit in the book or the book has been running for a long time, most order only to fill pulls – but they also guide retailers in different ways. Brower said, “if two or more people add a title we didn’t plan on ordering for the rack, then we order it for the rack.” That general idea is something others mentioned. It was interesting to note that several retailers make an exception for Image, ordering deeper for them than they would for other publishers. As G. Scott Tomlin from Comics Dungeon in Seattle said, “we will role the dice particularly on Image and other creator owned properties a bit more,” and that’s something others agreed with. Preorders are a guide for most, but ultimately sales history is the biggest driver for retailers. What a customer did in the past guides what they’ll do in the future, and that’s the case for almost every industry. The last part of this section is a look at how retailers get people in their stores, and beyond that, how they put books in their hands once they’re there. Over half of retailers who responded said they advertise to bring in more customers, and the majority of those use online and social media advertising. As a person who works in the field, I applaud them, and many have seen positive results leveraging targeted Google AdWords (the ads you find on Google searches and on Google Display Network websites) and Facebook ads. Some do utilize traditional advertising like newspapers, but even amongst their number, they’ve found online efforts to be more effective. Beyond that, shops have used search engine optimization, e-newsletters and social posting to great effect, expanding their reach and informing their customer base with minimal effort required. 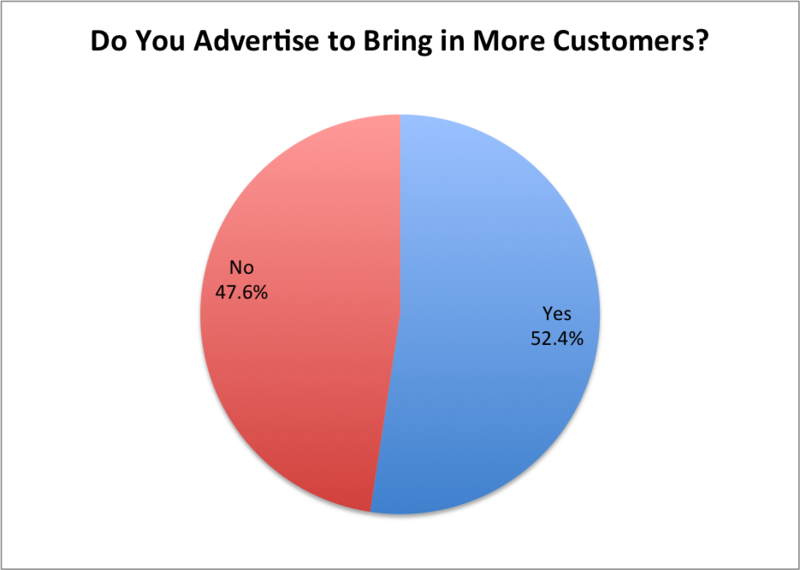 Those who said no have just found that advertising is too expensive or too intimidating to jump into, and I don’t blame them. There’s a lot of noise out there, and trying to make an impact amongst the millions of other voices can be a frustrating experience. In regards to in-store tactics, retailers cited everything you can think of. The most often mentioned were events to draw customers in and signage, staff picks, podcasts, book clubs, and themed displays to get them buying different books. Far and away the most common effort though is hand selling, and it’s easy to see why. Hand selling is the simple act of engaging with your customers and finding what they like and don’t like, and then guiding them from there. Many said that is the most impactful method, and that explains why so many shared having a friendly and knowledgeable staff is the most important characteristic in any shop. I could not agree more, which is why it’s surprising how few shops I’ve been to that do such a thing. 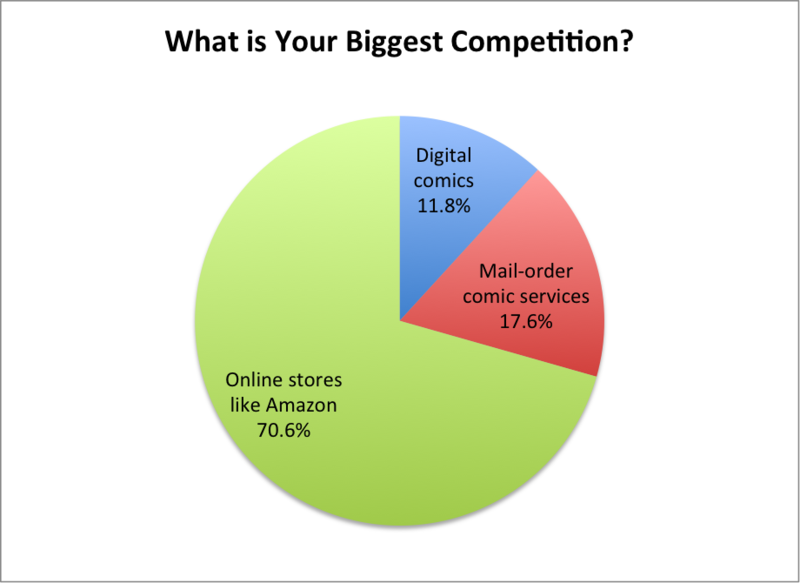 The last section we’ll dig into is how retailers view the comic industry overall. While this is less about their day-to-day experiences, it is valuable. As I said, retailers are important to the world of comics, and their opinions are invaluable. 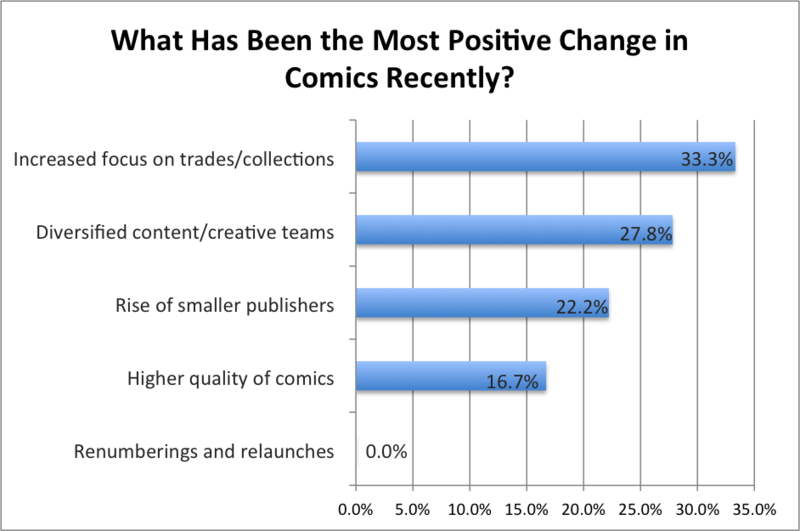 For the most part, retailers think the comic industry is in a great place. Incredibly enough, several who answered that we are at a peak believe there is still room for growth, especially for Image and non superhero books which continue to reach new and casual readers. Not only do most shops think the industry is doing well, they believe it’s sustainable unlike other times in the past. While some said they miss the speculator driven bubble – one mentioned missing the days of the low selling titles that still sold 200,000 copies – most are happy with where things are. The most positive recent changes in comics fits into a lot of what we have already talked about. Trade and graphic novels were the number one reason, especially with the kids graphic novel boom driven by people like Telgemeier and Kazu Kibuishi. Diversified content and creative teams was another positive change, and that makes the recent comments from Tom Brevoort about its hip hop cover month feel all the more tone deaf. As Thompson shared, “diversified content and creative teams has spilled over into a diversified audience,” and when potential new readers of different races, genders, ethnicities and sexualities see the same old faces on books at Marvel and DC, it turns them off. The only people who don’t see that are the ones who run those publishers. Speaking of, the only option that received zero responses involved Marvel and DC. No one selected their relaunches and renumberings as a positive change, with one respondent even saying “all of the above…except the Marvel and DC relaunches.” There was an undercurrent of frustration with Marvel and DC that ran throughout the survey results, even if their releases are still the foundation of most of these businesses. Fittingly after running a piece breaking down why there aren’t too many comics being published today, the biggest issue in comics according to retailers is that there are too many comics right now. Smith shared, “the Big Two are producing way too much with the smaller titles barely able to stay alive and just crowding out the stands for other publishers,” and that’s a sentiment many agreed with. Pairing the top two answers together, most wished to see Marvel and DC publish less and focus on releasing a higher quality of comics, which Klokel agreed with. Another common theme retailers agreed on throughout is that quality and diversity Klokel spoke of. While that doesn’t mean they order big on every book, it does mean publishers like Image, Boom! and First Second providing alternatives for readers arm shops with something for those readers frustrated with Marvel and DC. For those unaware, Diamond Comics Distributor provides comics from almost every publisher for comic shops. It’s who shops order through. 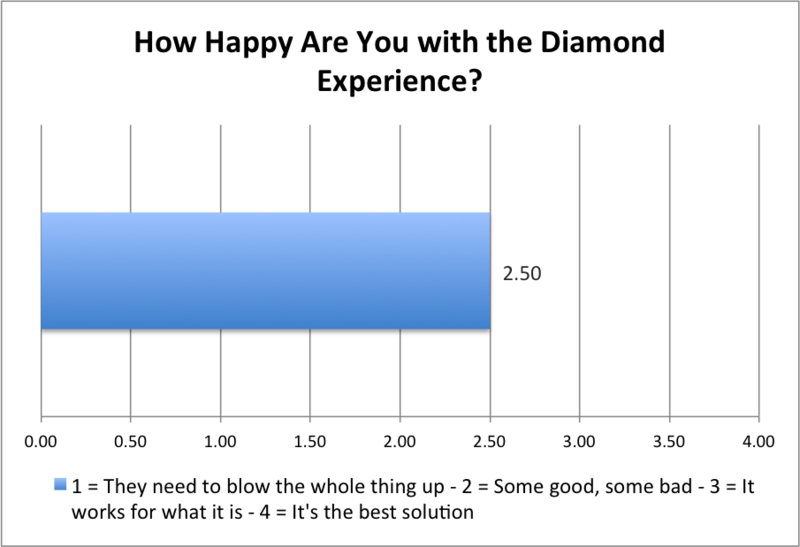 In terms of issues, I expected the distribution method and what Diamond brings to the table to be a greater one, but overall, most shops are okay with them. Many are frustrated with the monopoly they have—one retailer said, “it’s ridiculous that such a monopoly exists in this day and age, but it does and there doesn’t seem to be much we can do about it”—and that can lead to shops being shorted or receiving damaged comics with no recourse available to them. However, some said there are advantages to the single-threaded nature, including only having one ordering sheet and being able to develop relationships with their staff. Those relationships are common amongst the stores who had the best Diamond experiences, as having open lines of communication has delivered better results for some. Ordering errors and poor packaging are the most often cited problems, but most shops are understanding. For the amount of orders Diamond has to do, they do an okay job. As one shop said, “for the sheer volume of product released – of course there’ll be mistakes – damaged items, items invoiced but not arriving – but I find them professional to deal with – and certainly not terrible.” Do retailers wish things would be better? Sure. But it’s what they have, and the experience is mostly a satisfactory one. From those who responded, most shared the biggest competition they face is from Amazon, and that’s something every print medium has faced. Amazon can undercut cover prices in a huge way, and for budget conscious customers, that can make a world of difference. Amazon’s the number one answer by a mile, with the online sales giant acting as the Thanos to the retailers’ Avengers. I can’t blame them. However, while Amazon was the most commonly cited answer, several wrote in that the sheer amount of entertainment options people have today is an even bigger issue for them. That cuts down on visibility, and as Smith said, the superhero movies and TV shows are not enough. Every entertainment industry is facing that, though, especially ones who rely on brick and mortar stores like comics do. Many obstacles face retailers – oft mentioned ones include maintaining cash flow, inventory struggles, staying on top of all of the changes in comics, and even the retailers themselves – but when it comes down to it, maybe the biggest one in the near future is maintaining relevance in a world where every potential customer is a battleground. Make no mistake: being a retailer is a tough job. It’s not just sitting around talking comics all day. As Shorr said, “selling comic books is hard work. If you’re not willing to put the time and effort into your store your customers will quickly notice and start looking for other venues.” While you can’t say there is an exact correlation between effort and success in comics retail, it is important to finding and keeping an audience. That means long hours and a lot of heartache. 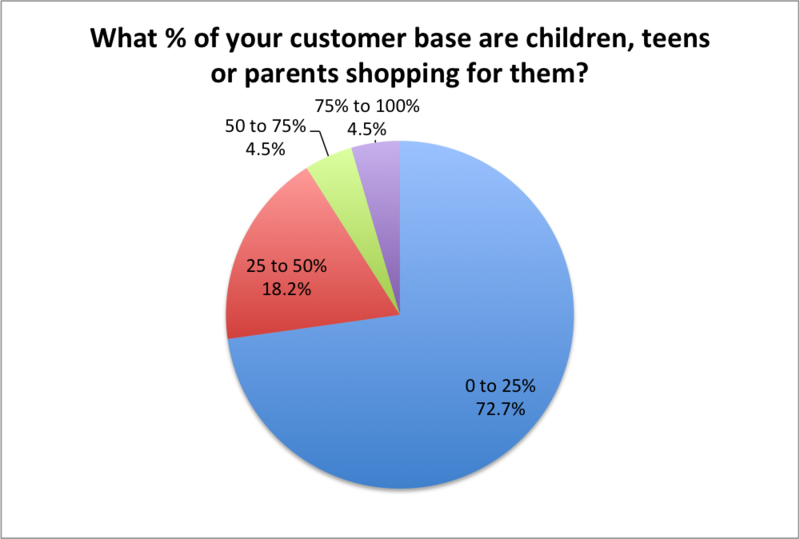 But when I asked for final thoughts from retailers, most shared glowing sentiments. Despite everything, retailers said things like “I love my job!” and “Nothing I’d rather be doing!” To me, that’s wonderful. The percentage of people who are doing what they love for a living is low, and for most in comics, that’s why they do it. Retailers are no different. It’s work, but it comes from a place of love. More than they have in a long time, comic retailers are doing just that. Thriving. That’s a good thing, as retailers are at the core of this medium we love. They’re the pulse of comics. As much as we love to focus on the publishers, creators, drama and other sexier aspects of the industry, these men and women who go to their shops every day and sell the comics we love are the foundation on which everything comics is built. It’s important that all of us recognize that, and remember to applaud them for the good work they do at least as often as we tear them down for the times they’re shorted on a book or sold out of something we want. And I’m not just saying that because I want to be one of them, I swear. A big thanks to every retailer who participated in this survey, and to every person who has ever sold me a comic. Header image is a shot of Bosco’s Comics in Anchorage, Alaska.